LAST 4 MATCH REPORT UPDATE..
Hum aaj apni last 4 matches ki reports ko website par upload kar rahe hain. Last 4 matches mein se humara 1 match wrong hua aur 1 match No profit No loss raha. 2 match mein humari report right rahi. Jisme se 1 match Jackpot bhi tha. Hum apni sabhi reports ke sahi sahi screen shot upload karte hain. Chahe humari report right rahi ho ya wrong rahi ho. Other tipsters ki tarah sirf right report ke bare mein hum nahi batate. 1. 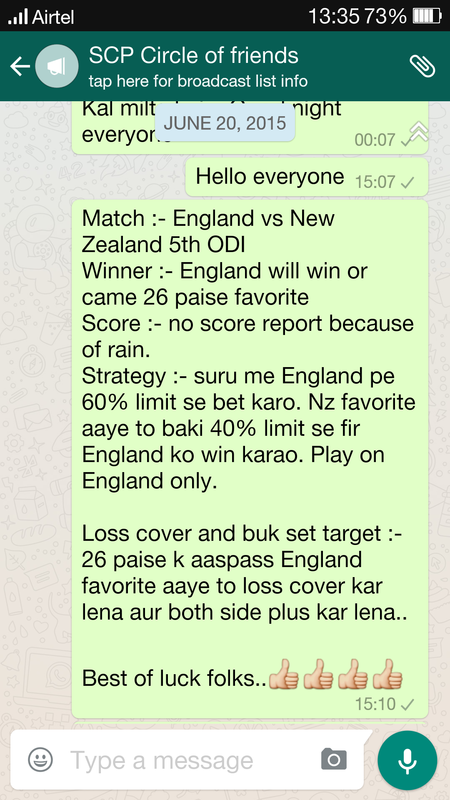 England vs NZ ( 5th ODI ) = Is match mein humne har bhav mein England win ki report apne clients ko di thi. Humne unhe ye bhi bataya tha ki NZ favorite aakar harega aur match mein NZ 15 paise favorite aakar hara. Is match mein humare clients ne Jackpot Profit earn kiya. 2. 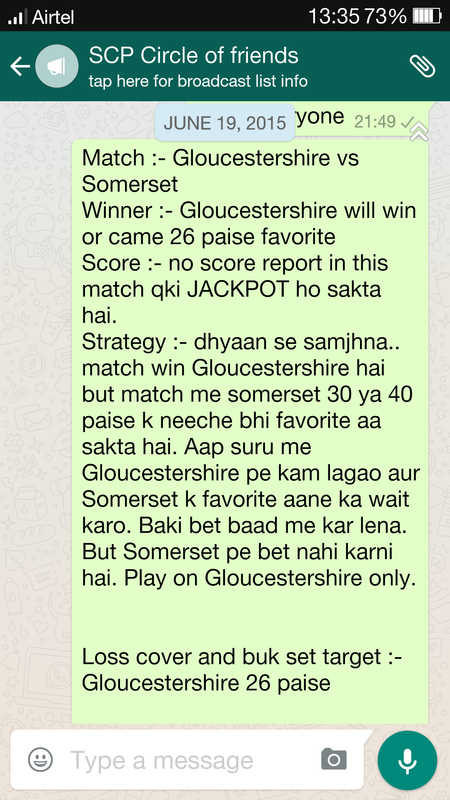 Gloucestershire Vs Somerset ( Natwest Blast 20-20 ) = Is match mein humane apne clients ko Somerset win ki report di thi aur match Somerset ne hi win kiya. Humare pass match ke beech beech mein bhi update aati rahti hai aur hum bhi apne clients ko hamesha updates dete rahte hain. Is match mein pahle Gloucestershire win ki report aayi thi but match suru hone ke 06 minutes ke baad hi humare pass Somerset win ki update aa gayi thi. 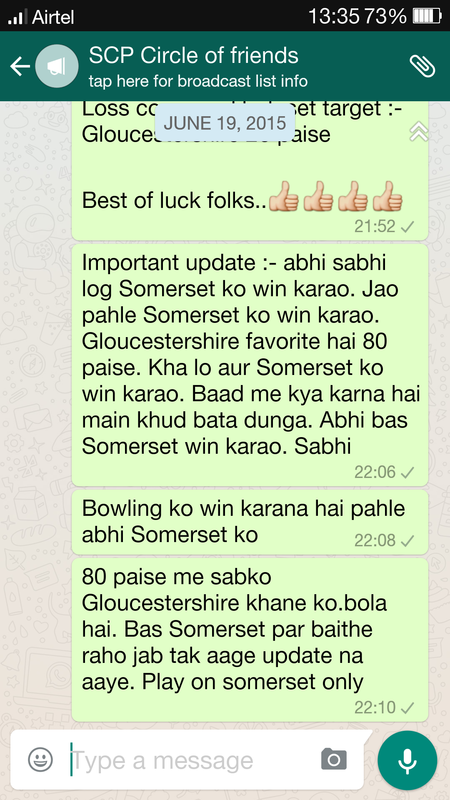 Humne bhi apne clients ko usi time somerset ko win karane ki report de di aur unhe kafi accha profit earn hua. 3. India vs Bangladesh ( 1 ODI ) – Is match mein humne India win ki report di thi but match Bangladesh ne win kiya. But is match mein humare clients ka nuksan nahi hua qki under 10 paise favorite aakar match hara aur tab tak mostly clients apna loss cover kar chuke the. 4. NZ vs England ( 4th ODI ) = Is match mein humari report wrong rahi. Humne NZ win ki report di thi but match England ne win kiya. Agar aap bhi SCP ka member banna chahte hai to aaj hi hume 09540808605 par call kar sakte hain.. Monthly Fees = 30 thousand in advance.. NO DEMO, NO TRIAL..